It’s the holiday season! Although many children might have tablets or video games on the top of their lists, it is a great time to look for fun games and activities to do! These activities should not involve a screen and actually promote children’s speech, language, fine motor skills and coordination. Communication is key for building vocabulary and strong language skills. Gifts that involve pretend play and story-telling will always be on the top of my list. Gross and fine motor skills are also important for children to develop, and there is nothing like tricycles, scooters or jump ropes for gross motor skills. There is also play-doh, crayons and arts & craft gifts work beautifully for fine motor skills. I am interested this year in looking for gifts that promote bilateral coordination. These activities are great for coordinated and fluid movements that require both sides of the body. It also involves the processing and integration of both hemispheres of the brain to enable both hands to work together at the same time. It’s essential for many daily activities such as self-feeding, handwriting and getting dressed. Most importantly, the games that promote this kind of coordination are simply fun! There are great stocking stuffers for children of all ages that promote important developmental skills. Junior editions of word finds and crossword puzzles help build vocabulary and literacy skills while journals and diaries are great for helping children practice their writing and vocabulary. Jump ropes and small balls help promote motor skills and bilateral coordination since both hands are doing something at the same time. In addition, art projects that involve threading, lacing, coloring, tying laces or writing are also perfect for fine motor skills and bilateral coordination. These activities help children learn to use their dominant hand to perform a task while their non-dominant hand assists. Books are always a great holiday gift and are such an important part of speech and language development. They help children step into new worlds, learn new vocabulary, ask and answer questions and even pretend play by acting out the story. Another great gift idea for building literacy includes magazine subscriptions. Prices are lower than ever, and children love to get their own mail. Try National Geographic Kids, which is always a favorite of mine. 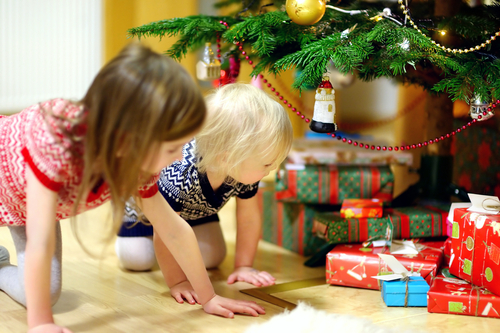 There are other great toys and activities to add to the holiday list to promote creativity, build vocabulary and help children develop their language skills. I particularly like magic kits and anything involving puppets or dolls for pretend play. If your child likes animals, farm houses are always popular, as are zoo sets and ocean creature sets. Do you have an aspiring chef in the house? Playing with pretend food allows children to act out social situations such as grocery shopping or dining out. If your child likes building, blocks and building toys such as Legos and tinker toys are also instrumental for fine motor skills, bilateral coordination and language development. I also cannot say enough about board games that are great for language skills such as Headbandz, Apples to Apples and Creationary. I use these all the time in speech sessions, and kids LOVE them!